Happy New Year! Markus and I hope you find some great technology tools to add to your toolbox in 2019! This month’s technology tip is Doodly, a unique video creator. Most of the time, Markus and I write about free technology, but this month I wanted to share a technology tool “deal” that could put a unique, eye-catching, engaging video creator into your teaching toolbox. Doodly is a technology tool that allows you to easily create professional looking videos from simple visual sketches. Best of all you do not have to have any drawing ability. If you want to create video’s that are different, grab students’ attention and help simplify explaining difficult topics, Doodly may be the technology tool for you. Doodly allows users to create drawings on various backgrounds, including whiteboard, blackboard, greenboard and glassboard canvases. There are numerous doodle images available in the standard software. For a slight one-time upgrade fee ($97) to the Enterprise version, you can add thousands of more images to your Doodly library. To get started, simply select your image, then drag and drop it onto your Doodly canvas. Perhaps you want to add your own images? Doodly allows you to upload .jpg images, including those you draw yourself. Whatever images you choose to add to your canvas, Doodly can draw them for you. Doodly also has a large selection of drawing hands to choose from (male, female and various ethnicities), so you can customize your video’s hand image, or you can choose the “no hand” drawing option. Do you want to add music to your video? Doodly provides royalty free music tracks that are easy to add. You can also record your own custom voiceover audio directly within the video creator or upload your voiceover from another recording source. Whichever audio option you choose, it is simple to sync and/or edit audio with your doodle sketch. Once you have created your Doodly video, save it in an mp4 format, then upload it for sharing to YouTube or another video web hosting source. Doodly works on both PCs and Macs. After your online purchase you will receive a confirmation email with instructions on how to get started. 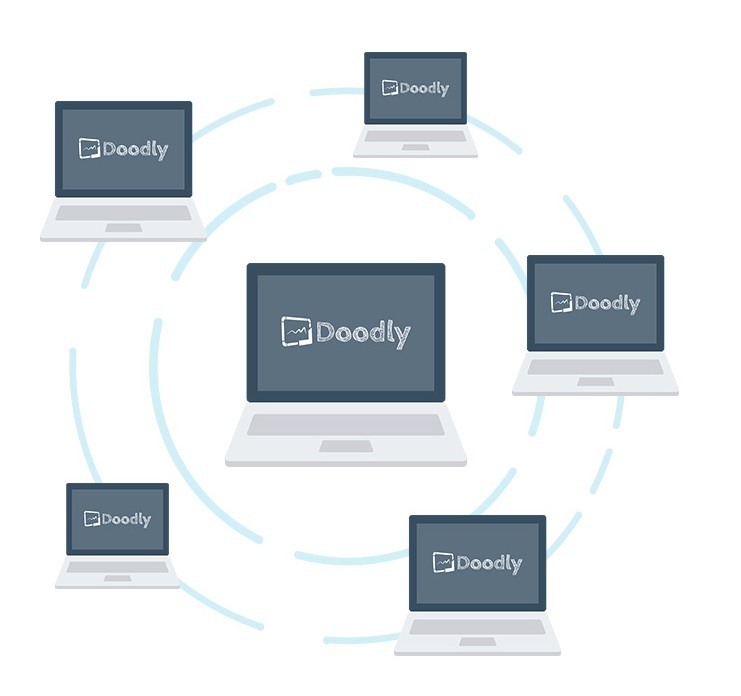 Best of all, Doodly can be downloaded to as many computers as you like, making it convenient to use with multiple devices, in multiple locations. While Doodly is simple and intuitive to use, it also has helpful support and idea options including FAQ’s, tutorial videos, a help desk and a Facebook user group. Normally. Markus and I pass over technology tools that aren’t free or don’t offer a free trial; however, Doodly’s limited time Facebook special offer (a one-time $67 fee, no annual renewal, free updates and a 30-day money-back guarantee), was too good to pass up. Doodly is a great technology tool to kick off the new year! *Doodly’s regular website (www.doodly.com) does not offer this limited time savings option.